Eps 41 - Come, God of Dragons - And Pretty Please Grant My Wish! 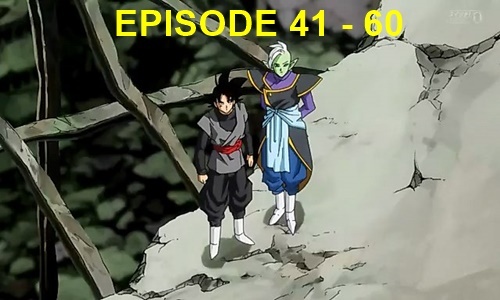 Eps 45 - Vegeta Disappears?! The Threat of Duplicated Vegeta! Eps 46 - Goku vs. Duplicated Vegeta! Who's Gonna Win?! Eps 47 - An SOS from the Future! A Dark New Enemy Emerges!! Eps 49 - A Message from the Future - Goku Black Strikes! Eps 53 - Uncover Black's Identity! To the Sacred World of the Kais! Eps 55 - I Want to See Son Goku - Zen‐Oh Sama's Summoning! Eps 59 - Protect Supreme Kai Gowasu - Destroy Zamasu! Eps 60 - Back to the Future - Goku Black's Identity Is Revealed! !